I have this list of Hip Hop artists that I have to see before I die and although I have been lucky enough to cross a lot of names off that list including Run DMC, The Beastie Boys, KRS ONE, Gangstarr, De La Soul, Co Flow, Mobb Deep, Wu Tang, Snoop, Cypress Hill and The Roots. Until recently one of my favorite groups ever were still sitting on that list, M.O.P. but last week I was lucky enough to see them in London's Jazz Cafe a venue that really allowed them to put on a sick show and engage with their fans. 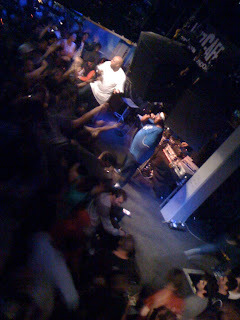 Lil' Fame and Billy Danze came on stage at a professional 21:10 which was a refreshing change from those artists that wander onstage after leaving the crowd waiting for hours. They immediately jumped into a hyped show pausing occasionally to give members of the crowd plastic cups of Hennesey or Vodka, a nice touch. They played all the tracks you would want to hear at an M.O.P. concert; Fire, Four Alarm Blaze, Downtown Swinga, Put in the air etc etc. They briefly paused to pay respect to Hip Hop's fallen soldiers as is customary these days. Then they launched back into some more insane rowdiness, provoking an almost mosh pit at the Jazz Cafe, a sight I don't think the venue had seen before. They finished up the show with Ante up, of course and the crowd went Wild. M.O.P. gave so much energy to the crowd and the crowd gave it back creating a fantastic atmosphere. They then left the stage having done more than an hour, playing all the songs I wanted to hear. But that wasn't the end of the night. Fame and Billy went to the upper restaurant area of the Jazz Cafe and stayed around chatting, drinking, signing autographs and taking photos with the fans for more than an hour. They showed their fans the level of respect that is often missing from Hip Hop shows, certainly ones performed by US artists anyway. In doing so they guaranteed that any chance I get to attend an M.O.P. show I will make sure I'm there. I have never met a friendly pair of rappers than Billy Danze and Lil Fame. They put on a great show and were real friendly. I couldn't have asked for anymore from a Hip Hop show.